Kumas » Spiteful Brewing & Kuma’s Corner Collab Beer Release! Spiteful Brewing & Kuma’s Corner Collab Beer Release! 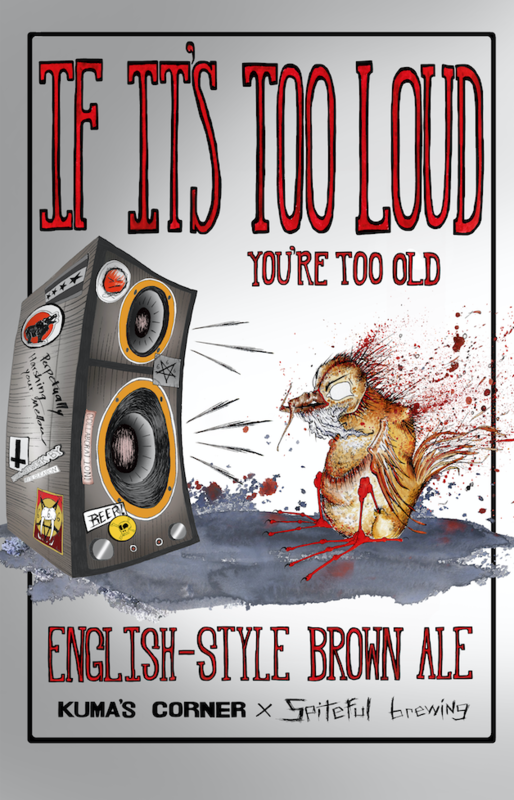 Spiteful Brewing and Kuma’s Corner unite to deliver “If It’s Too Loud…You’re Too Old”, an English-Style Brown Ale! Balancing toffee, caramel, dark fruit, and biscuit flavors with mild floral and earthy hop profiles derived from quintessential British varietals, “If It’s Too Loud…You’re Too Old” is creamy and crushable. This dangerously refreshing North English-inspired brown ale is available only Kuma’s Corner and Spiteful’s taproom. We’re tapping this deliciousness at all Chicagoland Kuma’s, this Friday, February 16th! Art by the talented Bryn Gleason!